From 1975 to 2009, Neil Sterritt and his family lived at Temlaham Ranch, the site of a Gitxsan ancestral village on the Skeena River (a.k.a. Temlaxam or Dimlahamid), during which time he was hired as land claims director for the Gitksan-Carrier Tribal Council. A member of the House of Gitluudaahlxw, he was president of the Gitxsan-Wet’suwet’en Tribal Council from 1981 to 1987, key years leading up to the precedent-setting aboriginal rights case known as Delgamuukw v. BC. As one of the principal architects of the 1987 court case, Sterritt was on the stand for 34 days during the Delgamuukw trial. 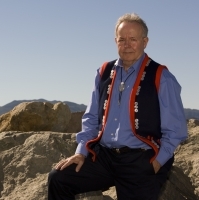 He has since written extensively on aboriginal rights and governance and served as a consultant to many aboriginal organizations around the world, having co-authored Tribal Boundaries in the Nass Watershed (UBC Press 1999). 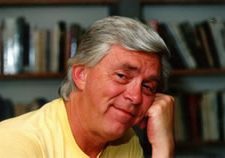 In 2008 Sterritt received an honorary doctorate from the University of Toronto in recognition of his “lifetime contributions to the understanding and expression of aboriginal citizenship in Canada”. He also served as Director of Self-government, Assembly of First Nations in Ottawa from 1988 to 1991. 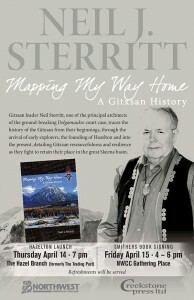 In Mapping My Way Home: A Gitxsan History (Creekstone 2016), Sterritt traces the history of the area at the junction of the Skeena and Bulkley Rivers, the resiliency of the First Nations residents who have maintained the villages of Gitanmaax and Hazelton, as well as his own personal story of growing up in Hazelton and helping his people fight the Delgamuukw court case. 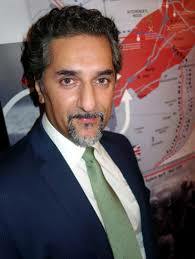 His overview stretches from the creation tales of Wiigyet to the advent of oil and gas pipeline proposals, including tales of the Madiigam Ts’uwii Aks (supernatural grizzly of the waters), the founding of Gitanmaax, Kispiox and Hagwilget and the coming of the fur traders, miners, packers, missionaries and telegraphers. Neil Sterritt and his wife, Barbara, now live near Williams Lake. From 1975 to 2009, Neil Sterritt and his family lived here at Temlaham Ranch. My parents and grandparents, aunts and uncles told exciting stories about growing up in northwest British Columbia. They laughed and joked, gossiped and teased. They spoke of amusing, larger than life people and romantic places along winding forest trails, places like Kisgegas, Kuldo, Bear Lake, Manson Creek, Telegraph Creek, the Omineca and Cassiar gold fields and the Yukon. Their stories gave texture and meaning to my mental maps. I longed to travel their trails, to experience those places for myself. Later in my life I did that, and went far beyond the familiar paths of my ancestors. Eventually I realized that maps, both imagined and real, can unite people and define their connection to the land, family, culture, language, history—to home. But that would come later. I was born and raised in Hazelton in the 1940s. My father was born in a Gitxsan village, Glen Vowell, and my mother was born in a Newfoundland outport village, Little Bay Islands. Whenever we visited my Gitxsan grandparents, the adults spoke Gitxsan unless my mother was present and then, out of respect, they switched to English. 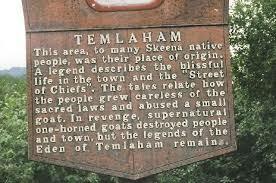 Hazelton was the white community, and Gitanmaax—the reserve just up the hill from our house—was the Gitxsan community. There were disputes and rivalries between the children of these communities but they were never serious. And when it came to sports and games, we all played together. Horses and cows wandered the dirt streets and wood plank sidewalks. Because livestock ran free, everyone fenced their yards to protect their gardens. During spring breakup we all played in the melt water that ran down the hill and along Government Street, building dams and making hand-carved boats. We caught (and set free) swallows with simple bolo-like devices as they swooped about looking for nesting material. We played marbles and other children’s games along the streets and in the school yard. The only building specifically designated a school was next to our house. It had one teacher who taught about twenty pupils in several lower grades. Empty buildings here and there about town provided makeshift classrooms for those in the higher grades. Barrel stoves were lit each cold morning to heat the schools. Our homes were heated the same way, with the addition of a McClary cook stove in the kitchen and a wood or coal heater in the front room. During winter we slid on sleighs, cardboard or tin or skied down Smith Hill and the hill by Gitanmaax hall, near our house. Hazelton had three general stores, a drug store and confectionary, a hotel, three Chinese cafes and a Chinese laundry. Wong’s laundry sat beside the Skeena across the road from our house. There we frequently watched Wong and his Chinese brethren smoke a bamboo water pipe. There were three churches: Anglican, Catholic and Pentecostal. Although located off reserve, the Anglican Church hall also served as the Indian day school for those of our Gitxsan friends who did not attend residential school. Kids from mixed marriages went to the Hazelton Superior School in the lower grades. In the upper grades children of all races from the surrounding villages attended the Hazelton Amalgamated School. The school was opened in 1951 by the Gitanmaax Band Council, the Hazelton Municipal Council, BC provincial officials and local residents and was reputed to be the only school of its kind in Canada. The Gitxsan children who did go to residential schools in places like Lejac, Lytton, Port Alberni and Edmonton in the fall usually came back in the spring. There is no doubt many Gitxsan children suffered different forms of abuse while attending residential school and some never came home again. Others benefited from the experience, picking up practical skills and acquiring an education. Some also formed lasting alliances at residential school that benefited both them and their communities as they battled for recognition of aboriginal rights and title to land in subsequent years. Hazelton’s community hall served many purposes: concerts and dances, meetings, recreation such as boxing and wrestling, badminton, basketball and volleyball, and afternoon and evening movies on Saturdays, with my father running the projector. Government services included the Indian Agent, Forest Service ranger station, public works, the RCMP detachment and a jail. Telegraph services existed from about 1900, a telephone before 1921, and party lines from the late 1940s. A diesel generator, owned by R.S. Sargent & Company and operated by my father when he returned from Europe after WW II, provided electricity to most of the town. Several springs or wells provided fresh water to those fortunate to have them nearby. The rest of us packed water in buckets from the Skeena River year-round. Rainwater sufficed for laundry and bath water during spring, summer and fall. We, and most others, bathed in a galvanized tub in the kitchen for most of the 1940s. Everyone had an outhouse, some with two-seaters for those who didn’t mind the company on a freezing winter day. The United Church-sponsored hospital was built one mile from town in 1903 on land that Chief Gidumgaldo designated for that purpose. Gitanmaax Reserve accommodated the Salvation Army church and the Salvation Army hall that doubled as a school. The Gitanmaax community hall was used for on reserve events such as dances, weddings, funerals and feasts, although feasts had to be held secretly because of federal legislation banning them. The ball field at Totem Park was on reserve, as was our swimming hole on the Bulkley Slough. Employment along the Skeena was mainly seasonal, based on trapping, selective logging, farming and, for aboriginal people, the commercial fishery in the Skeena estuary near Prince Rupert. Government services, the hospital, several retail stores, the Silver Standard Mine and Marshall Brothers Trucking provided steady employment for some, including the blacksmith because horses were still the main mode of transportation. At the same time, everyone added to their meager incomes with large gardens and by harvesting domestic and wild berries, salmon and wild game. Potatoes and carrots were stored along with canned or jarred fruit and jams in frost-free cellars dug beneath kitchen floors. In summer, homemade root beer put up in beer bottles was kept cool there too, a treat not to be underestimated and almost equaled by Bud Dawson’s ice cream which arrived weekly by train in large insulated canvas tubs. Many Gitxsan families made a living logging spruce and hemlock trees for lumber and western redcedar trees for telephone poles. The BC Forest Service allocated timber limits to those wishing to log. Trees were felled with axes and crosscut saws. I recall my grandmother, Kate Sterritt, working at my grandfather Charlie’s pole camp. She might fall and peel a twenty-five or thirty-foot cedar tree between lunch and supper. She was as much a driver of their business as my grandfather. 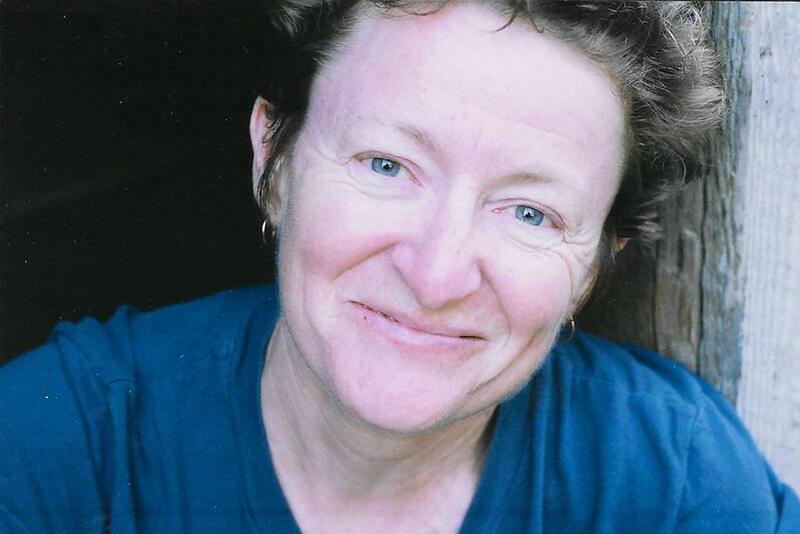 She too was an entrepreneur and managed their rental cabins in Hazelton. One afternoon she came walking down the hill towards us on her way home. She had a four-gallon cedar bent box filled with huckleberries on her back and was followed by two large dogs with packs. She had been away alone for several days picking berries about eight kilometres from town. Although she had limited writing skills, she knew how to delegate. I recall on two occasions when she needed to convey a message and told me what to say as I printed the letters for her. Sawmill owners hauled their lumber to R.S. Sargent’s in Hazelton or to the railroad in New Hazelton. Some pole camps hired Marshall Brothers Trucking to haul their poles to the railroad. Others floated their winter’s harvest down the Skeena in river drives. This was an annual event when we watched the men break up logjams and send the poles past the village of Hazelton. 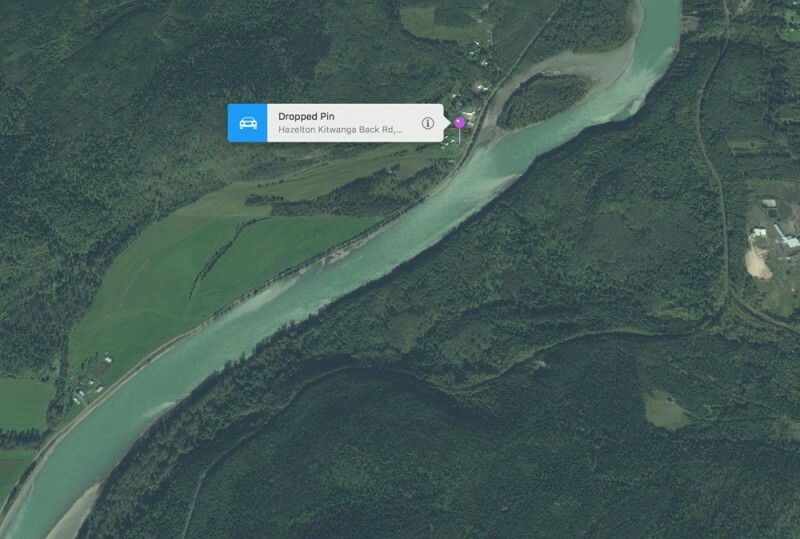 The poles were gathered in a boom that spanned the Skeena River at Nash Y, about a kilometre below the village of Gitsegucla. There men brought the poles ashore and, using a cable powered by a mechanical donkey, skidded them up a high, steep hill to the railroad on the right bank of the Skeena where men loaded them onto flat deck rail cars and shipped them to Minnesota. A small Catholic Church that my grandmother supported was built on Hankin Street around the corner from my grandparent’s house. She once asked my cousin Johnny and me to accompany her there. She had a child-sized fedora, which we called a gaytim (hat) Boston (American), for each of us to wear. We may have been six or seven years old and off we went, two little men wearing our fancy toppers. Frank Harris and his wife lived above the Bulkley River at the southwest end of Gitanmaax. Frank had an apple tree and four of us snuck into his yard, picked apples and ran off. We ate them down at the slough. A day or so later my grandmother summoned us to her house. She sat us in a row, held court and let us off with a lecture. In March of 1956, when I was fifteen, I quit school. As with many teenagers, it was obvious to me that I knew far more than my teachers and we weren’t getting along. I went to work for my father who had a pole camp along the left bank of the Skeena River north of Hazelton. He put me to work packing boulders from the road he was building with his D4 bulldozer. It took a pretty smart guy to do that kind of work. 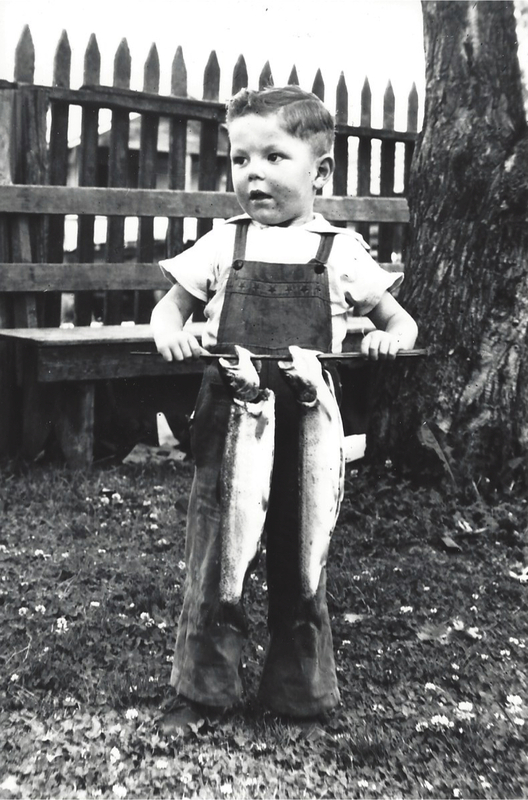 Dad started his pole business in 1948 using five-foot crosscut saws and work horses. By 1956 he had added a forty-pound power saw, the bulldozer and a team of horses to his outfit. I worked with him that summer, camping in a tent beside Sterritt Creek. I asked Dad how the creek got its name. He said he didn’t know. I assumed he was being modest and that it was named for him or his father. That fall my working days ended. I had been hunting mountain goat with several men who worked for my dad and arrived home on a Saturday evening in late September. 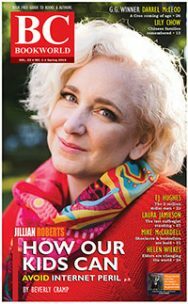 When I walked into the house my mother said, “You are going back to school,” and the next day I found myself on an airplane flying from Terrace to Vancouver. I might have gone back to school in Hazelton but was having a major dispute with one of the teachers there. Also, my mother knew I would be well cared for in Vancouver by relatives. Thus began my annual treks between Hazelton and Vancouver. My Aunt Margaret, Dad’s sister, and her husband, Bill Heath, had just moved to the Lower mainland with their children and bought a house in East Vancouver. My mother arranged to have me board with them. I enrolled in Grade Nine at Gladstone, a high school nearby and spent the next four years there. I returned in the summers to work with my dad but didn’t call Hazelton home again until my wife and I moved back in 1973. But for Gladstone, I might not have met Barbara, the daughter of Bill and Irene Hepplewhite, who was born and raised in Vancouver. In 1960, a friend introduced us and we dated for a few months. In 1963 we again began dating and were married in Port Moody in September. Barbara’s Aunt Hazel once read her tea leaves and said, “You are going to marry, have twins, and travel the world.” Hazel was right about the marriage and travel, but our sons were born in New Westminster and Winnipeg three years apart. I graduated from Gladstone in 1960 and went to the University of British Columbia for the next two years, still working summers with my dad. In the spring of 1962 I landed a summer job as a field assistant with Kennco Explorations at their Galore Creek property in northwestern BC. Company geologists taught me about rocks and minerals and I also learned that topographic maps, air photos, compasses and notebooks are basic geologist’s tools, used to plan field trips, and record key features and locations along the way. Later, in 1963, while still working with Kennco, I began to record information in the field that was transferred to working maps. 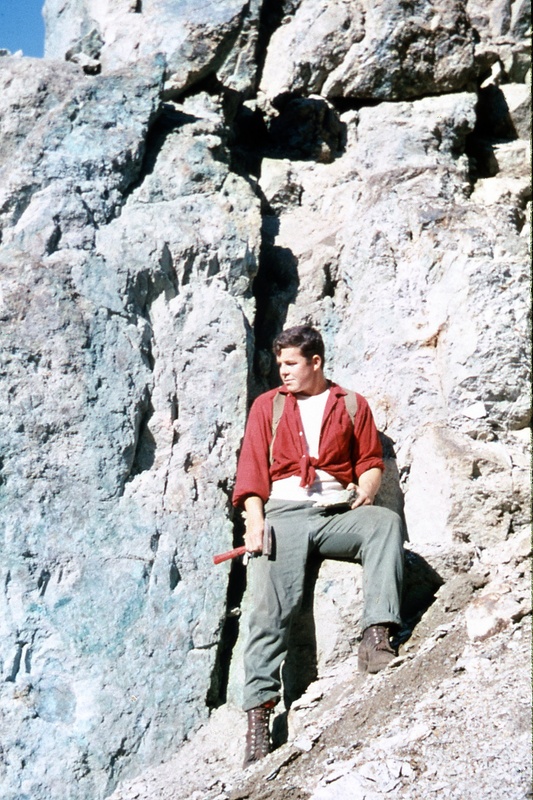 In the fall of 1964 I enrolled in the British Columbia Institute of Technology’s two-year mining technology program which included courses in surveying, mapping and drafting. I worked for Amax Exploration at their Lucky Ship property near Morice Lake during the summers of 1965 and 1966. After I graduated, Amax hired me full time. I was with some men driving cattle from the Chilcotin to the Yukon. It was a tough trip. The weather was bad. It rained most of that summer. Feed was scarce because other men were driving herds north too. Some of the horses died, and others were weak and lame and we abandoned them. We had to put packs on some of the cattle. I quit at Telegraph Creek and took a boat down the Stikine River to Wrangell, then to Port Essington and home to Hazelton. My grandfather was in his mid-teens at the time. The first lengthy journey I recall making was with my Uncle Walter, Dad’s brother, in 1952. He was driving to Chilliwack to get an engine for the sawmill he was building near Hazelton. The drive took more than four days over gravel and dirt roads in my grandfather’s one-ton Chevrolet truck. By contrast, the trips my grandparents took by foot, saddle horse, canoe and sternwheeler took weeks and sometimes months. And through my own journeys I have come to appreciate that the distances my grandparents traveled during their lifetimes—both geographically and culturally—began in the mists of time when our aboriginal ancestors first settled the Skeena Valley. While the village of Gitanmaax is so ancient that its years may be numbered in the thousands, Hazelton has yet to mark its second century. Hazelton is an incorporated municipality a few kilometres off Highway 16 between the 20th century communities of Smithers and Terrace. It was founded in 1871 when the Omineca goldfields proved viable. Soon after, Gitanmaax and Hazelton became the hub of a transportation network along pre-existing aboriginal trails that radiated east to Babine Lake and the Omineca; south to Fort Fraser and the Cariboo; west down the Skeena to Port Essington and Fort Simpson; and north to the Yukon. Another trail running west from the villages of Gitwangak and Gitanyow also linked upper Skeena villages to Nisga’a villages on the lower Nass River. Although Gitanmaax and Hazelton seem to share the same land base and services, there are significant historic and cultural differences between them. The colonial government surveyed the townsite of Hazelton and granted it thirteen acres of land in 1871. Canada imposed a 2,400-acre Indian Reserve on Gitanmaax villagers in the 1890s, although territories belonging to Gitanmaax chiefs run to the height of land of the surrounding mountains and east more than fifty kilometres to the Suskwa River headwaters. Today Gitanmaax falls under the jurisdiction of the federal Indian Act while Hazelton falls under the jurisdiction of the provincial Municipal Act. A casual visitor could be forgiven for assuming Hazelton is larger than thirteen acres. Gitanmaax and Hazelton appear to be one community with the reserve boundary bordering the town’s. On the side of the road by our house stood St. Peter’s Anglican Church. Nearby, overlooking Hazelton and the church, stood Gidumgaldo’s totem pole. The pole and the church symbolize very different histories, customs, values and beliefs. Gidumgaldo’s totem pole was carved and erected in 1881; St. Peter’s Church was built twenty years later. Gidumgaldo’s long house once stood behind the pole. My grandfather, Charlie Sterritt, was born there, in Gidumgaldo’s house, in 1885. Tribal Boundaries in the Nass Watershed (UBC Press 1999). Co-author.